BIM Building Information Modeling Newsletter | Allied Engineering, Inc.
Do You Even BIM? What is BIM and how is it evolving? As the building design industry has shifted towards BIM (Building Information Modeling), Allied Engineering has shifted with it. We began utilizing Autodesk Revit, one of the many available BIM software options, back in 2008 and we are proud to say that most of our projects today are designed utilizing Revit. What is BIM? Believe it or not, the first concept of BIM was back in the mid-1980s, the acronym was more commonly used in the early 1990s and finally made a solid presence in 2002 when Autodesk issued a white paper titled “Building Information Modeling.” As discussed in the white paper, BIM is simply the evolution of CAD. It is still “Computer Aided Design”, but with the addition of “Information”. It is a digital database, storing all of the building information from multiple disciplines and utilizing it to create a complete electronic representation of the building. With this digital representation, all disciplines can work together to analyze and visualize the design before it is built. Over the years, Revit has advanced to assist engineers with features such as heating/cooling load calculations, energy modeling, duct/pipe sizing, light level calculations, electrical load calculations, etc. Equipment vendors have also started designing their software packages to integrate into Revit so the Engineer can output custom equipment selections with all design parameters to a Revit file for use directly in the model. • Virtual Reality (VR)? VR is already jumping into the BIM world, as well as AR (augmented Reality) and MR (Mixed Reality). Because the BIM software creates an accurate 3D representation of the building, it can also provide very realistic renderings and walk-throughs. Architects, Engineers and their Clients now have the ability to “preview” the building during the design process. Could the day come where we are designing on the fly while in VR? • Paperless construction documents? Construction companies are already starting to build directly from BIM models in lieu of printed drawings. 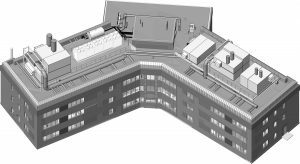 Though it sounds like it has been successful in some cases, this may be a little premature in areas where BIM Standards are not fully developed and contractors are just getting up to speed with the technology. • Facility maintenance/operation? Building owners now have the ability to view their entire building in a model format. This could be used to find a shut-off valve location when there is a leak, specific air handler information regarding filter size and when to replace it, perhaps even hyperlinks to the product websites, or instantly order replacement parts. Could this essentially replace the As-Built Plans and O&M Manuals? Just as when companies made the leap from hand drafting to CAD back in the 1980s, BIM requires that same investment. Updating hardware/software and providing training are the two critical items needed to be successful with the BIM transition. Allied is continually investing in systems and manpower to stay at the front of the pack when it comes to AEC design technology. Allied Engineering can meet your Mechanical, Plumbing, Electrical and Structural BIM requirements for any project, large or small. Have questions or still unsure about BIM, contact us anytime to setup a BIM demonstration. We’ll be happy to show you a few of our most recent BIM projects. 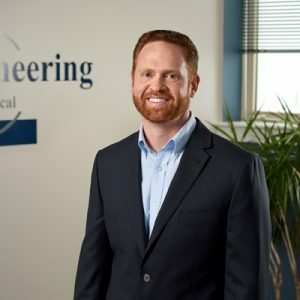 Scott has 20 years of experience as an HVAC/Plumbing designer with project management skills including design and preparation of HVAC, plumbing and electrical drawings, specifications and coordination with all other disciplines. Scott has been a CAD/BIM Manager responsible for implementation of office-wide new/updated software and standards. Enjoying what I do. I take every project as a new challenge, looking at it with fresh eyes and a fresh perspective. Keeping up with the latest advancements in our field gives me the opportunity to explore a wider variety of systems for each individual project.